I've decided Western Union (payment in GBP to USD) was the best option, none of them are ideal though. I'd say the 1.5 would be plenty. For fast road and track days 1,2 is enough! How much wider do those make the track? This kit adds 20 mm per side! How much is the 20mm wider kit? Do any of these kits work with drums or discs only? Why not just use 20mm bolt on good quality hub centric spacers, atleast you can adapt and change them easily, or am I missing something? Wide kit (+20mm) costs 195 euro. All our kits was designed for discs brakes. Some customers have wheels and spacers and they want standard kits some one wants wide track with our kit. I want to order a standard width (1.25cm each side) set but with -1.5 degrees camber already on the stub flange itself and no shims required. I have calculated: -1.5 degrees will roughly give you 0.75cm more space at the top between wheel and arches, widening of 1.25 cm each side will reduce space between wheel and arches 0.75cm total in the end. Safe enough when you have lowered the car. Last edited by micheldeman; 29-06-2016 at 05:21 PM. New type of rear camber kit now is done and ready for order!!! What material is the new stud made of slavesta? Thank you. I think I can elaborate on this one, it's my new set. Material is the same, but I have asked Slavesta to machine the camber (1.5 degrees) onto the flange itself, so there's no need for shims. I was just wondering if they are the same material as the original stub pin from factory,I'm sure they're strong enough,just curious that's all. Material is not like on standard studs! It is better material with special heating upgrad. So our studs much stronger then standard. 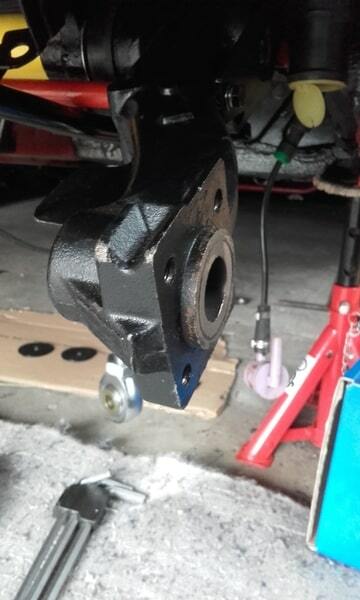 My rallye has front 106 gti brakes and rear oem drums, only for trackday use only do you have a kit suitable for my car? Our kit was designed for disk brakes rear arms. I think you can use our kit for drum brakes but i think you have to use some spacers for hub bearing. Hi , can you give me an idea of the width required for using on a saxo with s1600 kit car rear arches ? Rear arches can be 50 or 70 mm. You have to measure your arches. Mail me on denisovsu84@gmail.com i will explain. New coating on the kit! New type of fitting finished! 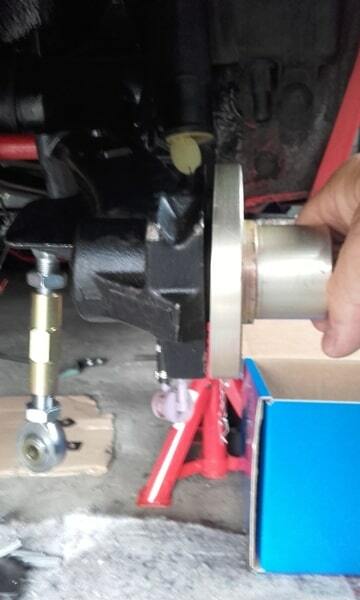 Now you can change camber and toe without hub bearing take off. Price for the new kit is 215 euro. Update for old type kit is 35 euro. Update kit will include: mounting studs, nuts, 2 stud spacers, 4 toe shims. That's pretty cool that you can upgrade the older version with the new one,might be getting one for mine,any suggestions on what toe setting for fast road/track day? Not 100% sure if it's worth adjusting that buy I admit I'm ignorant in the matter and really need to do more research,already have the 1,5 degrees plates,thanks. Best toe is 0 degrees. Kit was designed for fast changing of camber, without hub bearing taking off. Oh okay my mistake then,I thought the point of the new kit was to also offer different settings of toe to choose from other than the rest,hence the 4 shims that are included in the kit. Yes, when you lower the car, toe have to be changed!!! So this kit is for lower car upgrade. Only now I am fitting my camber set with camber machined on the flange itself. 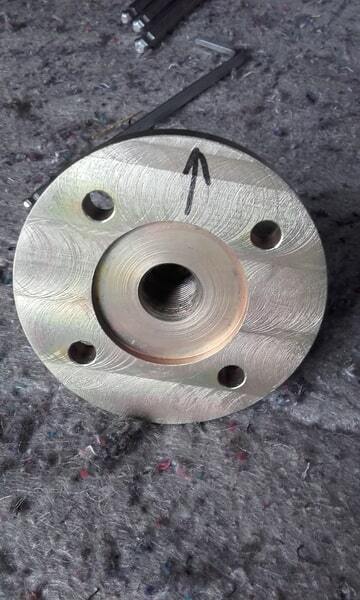 I have grinded away the piece from the arm as to your installation guide, but I am facing the following problem. The space left on the arm is about 5mm thick, the hole in the flange with camber is only 2-3mm deep. Result is that there's space left in between the arm and flange. As my set has camber already machined on the flange, I think you may have forgotten about the space that normally will be filled by the shims that are put in between. Plus, by machining the camber on the flange from a standard set, the dept of the hole also gets less. Last edited by micheldeman; 18-08-2017 at 06:45 AM. 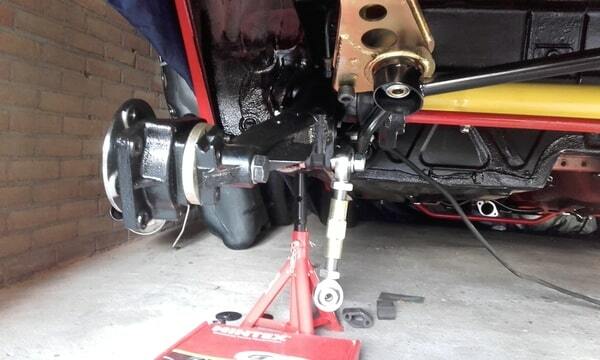 Holiday season I suppose, but I have grinded more off the arm and fitted the camber kit further as per the manual. I only had to take off 5mm from the M16 bolts as it was too long, but everything sits fine now and feels strong and safe. Good thing is to use a tap to clean out the treads of the 4 M8 bolts first before fitting the kit. Another thing is that the bearings are a very tight fit, had to use the stud nut to get them fitted. I believe these 2 things have been mentioned before, but one other thing to mention is that the shimmed washers do turn with the M16 bolt, so it's difficult, if not impossible, to get them aligned. I think better is to not shim the washers and leave them flat. Very nice setup you have there,I've encountered the same "issue" with the M16 bolt. This is as far as it went (and the washer here is free to move so not its fault). I cut off a small bit and that allowed it to tighten all the way and be torqued to 250nm. For the rest of the way I just used the bearing nut as you did as well,haven't tested anything yet but hopefully no problems arise,will keep a close eye to everything just to be safe. Many thanks for using our kits! Best way is to cut a part of rear arm and correct tee main bolt lengt! I see that you already made it. Your kit was first with angeled stud cut, so we made a little mistake, sorry for that. Waiting for new orders! New catalog of our parts will be soon!!! Just wondering how strong these are compared to the standard pins / hubs set up, as I'm using in a taramac rally setting? Kit is very strong, it already was tested on many rally stages! Does anyone have any feedback for using them in rallying? Has anyone tried to remove the wheel bearings as people have said they are very tight to fit. In request we can produce kit with sliding fitment of hub bearing! Big bearing kit with brake bracket fixing. I have a pair very similar to those. Great fitment, and the bearings/ hubs pressed on a treat. A lovely 1.2 degrees negative camber and +15mm. Now need to get some extra camber on the front. New type of camber/toe plates are available now! These can be turned while fitted to adjust camber and toe if I am correct? This plate for camber/toe kit, so yes you can adjust on the car but first you have to release mounting bolts.